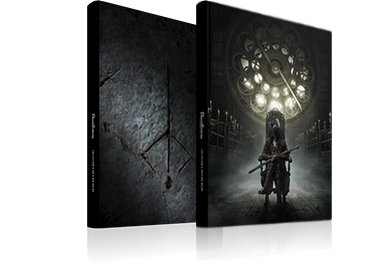 Wheelchair-bound residents of Yharnam equipped with various firearms, these enemies are barely mobile and unable to do anything but shoot - they effectively act as stationary gun turrets. What they lack in mobility, however, they more than make up for in firepower. Due to the ranged nature of most of their attacks, they are most threatening when they see you coming from a distance and you're forced to close in while under fire. Once you do get close, however, their lack of melee attack and very slow turning ability means that they're all but defenseless. Those using pistols and rifles have an extremely long reload time between each shot around 5 seconds), so once you see them fire you'll know you have a small window of opportunity to close in and get to the side of them, where it's safe. Ones armed with Rosmarinus have no means of hitting you at long range, but they are a serious threat at mid range. When you get close, they'll spray mist in sweeping frontal arcs, which are wide enough to reach you if you're standing beside them, so make sure you get right round to their back once you get close. The easiest way to deal with these enemies is to run up to them as quickly as possible and try to get around behind them before they can start using their Rosmarinus. Once you're there you can easily finish them off with a quick combo before they can turn around. If you can't get close to them, or they've already started firing, it can be worth using your own ranged attacks to hit them from outside the range of their Rosmarinus - just make sure to keep moving backwards so that you stay out of range. 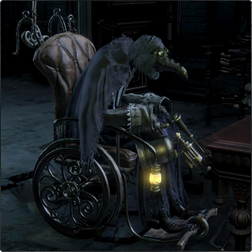 One Wheelchair Huntsman (Rosmarinus) and two with Pistol in Research Hall Laboratory F3 are hostile towards other enemies in the area and vice versa. Blood! Streets will run red!